A few days ago, Mark and I were finally ready to leave the island of Tahuata and the weather predictions looked favorable for a visit to the north shore of Hiva Oa. We prepared the boat for the 12 mile trip to Hanamenu Bay, lifted anchor and pulled the sails up. The main winch stopped working, so I hung my whole weight on the halyard to get the sail as high as possible. It ended up being a bit baggy, but it did the job. From the moment we pulled out of Hanamoenoa Bay, we received a call on the VHF from our friends on SV Iona, who we were going to meet at our destination. They were on their way back to Tahuata, after having a scary experience in Hanamenu. In the afternoons, when the land heats up, a strong onshore breeze enters the anchorage, kicking up the waves and trying to push you towards the beach, on a lee shore. When they told us about the 3 foot white breakers rolling in, we decided to play it safe and abort the mission to get there. Instead, we went for a little sail along Tahuata’s west coast and fished. 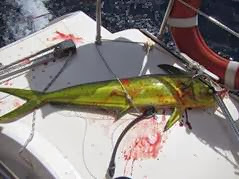 Before long, we hooked a decent size mahi mahi (dorado), which was a pain – literally and figuratively – for Mark to pull in with the hand line. After we successfully landed the pretty creature, finished the hard task of killing it and cleaning up the bloody mess, we had some tasty dinner prospects. It had been a while since we enjoyed a freshly caught fish! The avocados Teii picked for us formed a nice and rare accompaniment to complete the treat later that evening. 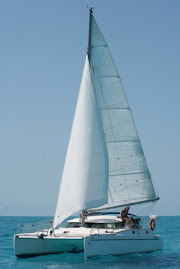 We turned Irie around and put two reefs in for the tack back to Hanamoenoa. The wind had picked up and we had a fun and invigorating sail, doing 7.5 knots at times, back to our comfortable anchorage. 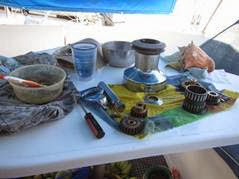 The afternoon was filled with taking the winch apart, without breaking anything, and cleaning all the parts, without dropping anything overboard. At least we were in a pretty place with clear water, if something made the jump. Tomorrow, Sunday, we will try to reach and explore the north coats of Hiva Oa again! How do you grow the garden on board? We would love to do one as well but were to.d we'd basically have to kill it off at each port. We're leaving beginning of november to cruise the caribbean and cental America. Thanks! It is our experience that as long as you leave the plants on the boat, everything is fine. There are not a lot of countries where Quarantine inspectors come aboard the vessel (Dominican Republic, Galapagos, maybe Belize as well; we haven't been there by boat). In those situations, we hid the plants just in case, but are not sure whether that was necessary. The agents - where required - usually don't care. It is hard to keep a garden (I use this term loosely) going, however. The salty environment is not very kind. It is better to have a permanent spot for them under the monohull dodger or so. We don't have such a protected spot on Irie. Hope this helps and happy sailing soon! We have put the separate plants into a tub recently, which makes it easier to move the bunch inside during (rough) trips. 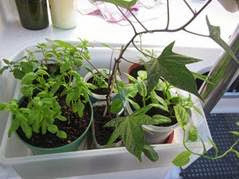 Most plants started with a clipping from another cruiser, which we rooted in a glass of water and then planted in a pot. The sweet potato (the least interesting plant) starts with a rooted piece of sweet potato which is buried in the dirt and won’t probably last long.